Methods of incorporating quantum mechanical calculations into molecular dynamics stimulations (A. Laaksonen, Y. Tu). 2. 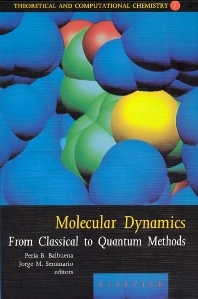 Classical molecular dynamics simulations with quantum degrees of freedom (J. Brickmann, U. Schmitt). 3. Spatial structure in molecular liquids (P.G. Kusalik, A. Laaksonen, I.M. Svishchev). 4. Thermodynamic integration along coexistence lines (D.A. Kofke, J.A. Henning). 5. Energy minimization by smoothing techniques: A survey (S. Schelstraete, W. Schepens, H. Verschelde). 6. Ab initio and DFT for the strength of classical molecular dynamics simulations (J.M. Seminario). 7. Large scale parallel molecular dynamics simulations (F. Hedman, A. Laaksonen). 8. Combined MD simulation-NMR relaxation studies of molecular motion and intermolecular interactions (M. Odelius, A. Laaksonen). 9. Transport properties of liquid crystals via molecular dynamics simulation (S. Sarman). 10. Interaction potentials for small molecules (F.M. Floris, A. Tani). 11. Ab initio and molecular dynamics studies of cation-water interactions (P.B. Balbuena et al.). 12. Interpretation of inelastic neutron scattering spectra for water ice by lattice and molecular dynamic simulations (J. Li, J. Tomkinson). 13. Stability and dynamics of ice and clathrate hydrate (H. Tanaka). 14. Molecular dynamics studies of physically adsorbed fluid (W. Steele). 15. Molecular dynamics of thin films under shear (S. Jiang, J.F. Belak). 16. Molecular dynamics simulations of chemical reactions at liquid interfaces (I. Benjamin). 17. Molecular dynamics simulation of copper using CHARMM: Methodological considerations and initial results (H.E. Alper, P. Politzer). 18. Dynamic Monte Carlo simulations of oscillatory heterogeneous catalytic reactions (R.J. Gelten, R.A. van Santen, A.P.J. Jansen). 19. Polymerization of rodlike molecules (D.V. Khakhar). 20. Potential energy and free energy surfaces of floppy systems. Ab initio calculations and molecular dynamics simulations (P. Hobza). 21. Ways and means to enhance the configurational sampling of small peptides in aqueous solution in molecular dynamics simulations (F. Nardi, R.C. Wade). 22. Molecular dynamics of pectic substances (B. Manunza, S. Deiana, C. Gessa). Index. The latest developments in quantum and classical molecular dynamics, related techniques, and their applications to several fields of science and engineering. Molecular simulations include a broad range of methodologies such as Monte Carlo, Brownian dynamics, lattice dynamics, and molecular dynamics (MD). Although the book is not formally divided into methods and applications, the chapters are arranged starting with those that discuss new algorithms, methods and techniques, followed by several important applications.